Camel is a color I’ve been reaching for a lot these days. 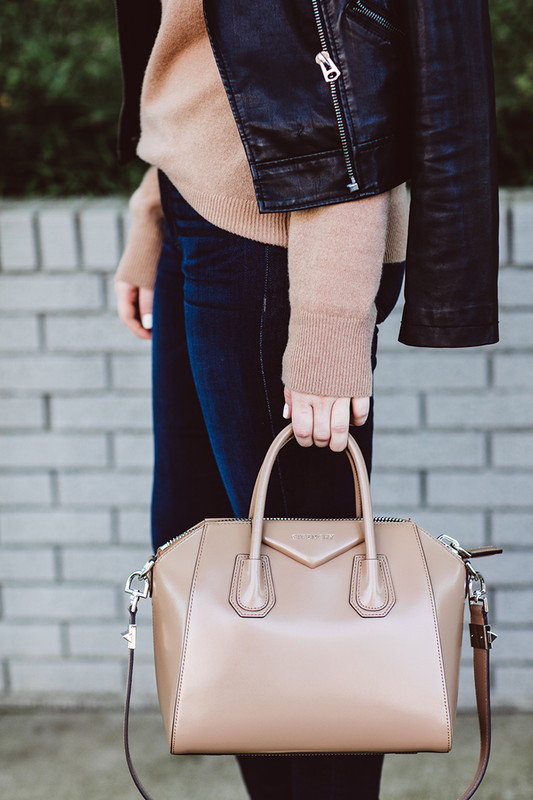 Its compatibility with other colors is kind of amazing – it’s the perfect neutral, at least in my wardrobe! You’ve seen this bag a few times on here now… it’s one I received on Christmas morning, and I couldn’t love it more! I praise the fact that the Antigona features silver instead of gold hardware, and the sleek, minimal design is just what I need to help streamline my looks. This sweater was actually a major sale find over the holidays. Doesn’t it look fab with my new bag? A match made in heaven, I’d say. While the sweater is no longer on sale, it is still available! It’s a classic style and comes in a bunch of other gorgeous neutrals. If you buy it in your normal size, it’s a little more fitted – I opted to buy a size larger than normal for a more oversized, slouchy feel. So love this look and again that bag is a beauty. Such an elegant look! I absolutely love that jacket and am shocked that it’s from Topshop – what a great find. Love your outfit! You look so gorgeous in camel! Camel is as universal as black in my book. I can never wear enough of it. Great outfit! I have been having such a moment with camel lately. I think it’s such a gorgeous color and this sweater is no exception! Love your moto jacket too! I’ve been on a major camel crush lately too! I have been on the hunt for a sweater just like you are wearing. I love this outfit on you! So chic lady! So chic, as always. I love an all camel look, and am actually looking for a new neutral/camel/tan bag. Yours is gorgeous but I’m torn between that and the Celine belt bag…tough decision! Nice! Love the combo of camel, jeans and leather jacket! You look so chic!